Our July issue exemplifies what many advanced aquarists are especially pleased to see – great advances in the captive breeding of some of the more “difficult” reef fish, and continued advances in the science of lighting. Sanjay Joshi, Ph.D. (professor of mechanical engineering at Penn. State Univ.) and colleagues have over the past few years have amassed, through carefully controlled experimentation, a substantial body of information about the intense lights we use to maintain our photosynthetic corals. They have, more than anyone else, enlightened the reef keeping public about the nature of light, how it is utilized by photosynthetic fauna and flora; and, how to be the most cost efficient when buying light sources and powering them. Even subjective issues like what color spectrum certain bulbs have which are especially pleasing to the reef keeper, when the symbionts simply want intensity, has been considered. 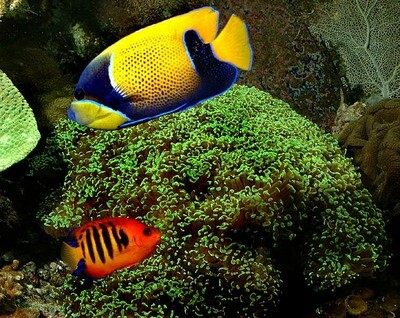 Hopefully, in the future angelfish like these in the editor’s reef tank will all enter our hobby from rearing farms. Continuing in this issue Sanjay and associates continue their study of reflectors and reflecting material. It is valuable to know what PAR (photosynthetic active radiation) a given bulb emits and for how long, but for aquarists how different reflector configurations focus PAR on their symbionts is equally important. By doing this experimentation and presenting this material to aquarists world wide they are providing an invaluable service. In this issue too, we have Martin Moe Jr. in a double column presenting a retrospective calling attention to the problems and solutions regarding the spawning and rearing of coral reef fish. No one could offer this historical perspective better than the true father of captive coral fish breeding. We are truly grateful for all that Martin has done for our hobby. Doug Robbins, Ph.D. in a departure from his usual media column, has turned his attention to the impact of ornamental fish collection in the Hawaii area, and shows and discusses some of the new breeding efforts taking place with Centropyge spp. that we all hope will be the ultimate solution to over collection. It’s a terrific sight to see all these tank raised pygmy angelfish swimming around in the rearing tanks.